Maduro, a leftist who replaced President Hugo Chavez after his death in 2013, was unharmed but officials said seven National Guard soldiers were injured. 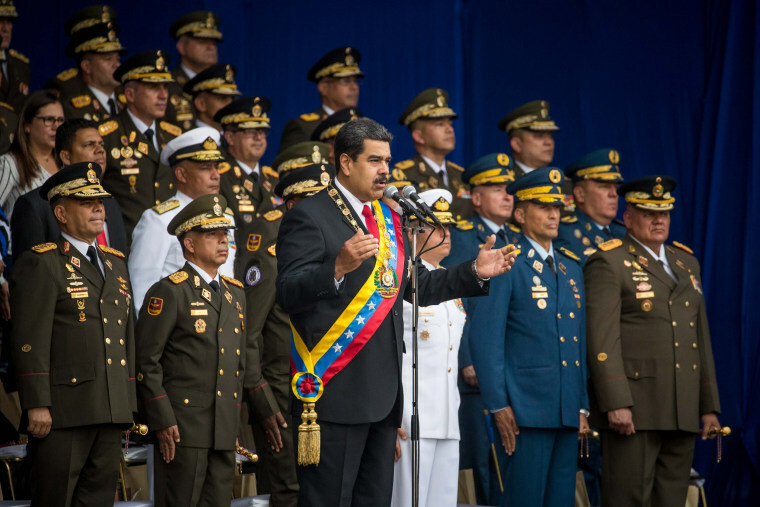 CARACAS, Venezuela — Venezuelan President Nicolas Maduro dodged an apparent assassination attempt on Saturday when drones armed with explosives detonated while he was delivering a speech to hundreds of soldiers being broadcast live on television, officials said. Information Minister Jorge Rodriguez said the incident took place shortly after 5:30 p.m. ET as Maduro was celebrating the National Guard's 81st anniversary. The visibly shaken head of state said he saw a "flying device" that exploded before his eyes. He thought it might be a pyrotechnics display in honor of the event. He claimed the "far right" working in coordination with detractors in Bogota and Miami, including Colombian President Juan Manuel Santos, were responsible. Prosecutors have already launched their investigation and obtained critical details from some suspects who were detained Saturday night, said Saab, adding that he would give more details Monday. Adding to the confusion, a little known group calling itself Soldiers in T-shirts claimed responsibility, saying it planned to fly two drones loaded with explosives at the president, but government soldiers shot them down before reaching its target. The Associated Press could not independently verify the authenticity of the message and the organization did not respond to a message from The AP. Michelle Acevedo and Dennis Romero contributed.